The Memorial Candle Program has been designed to help offset the costs associated with the hosting this Tribute Website in perpetuity. Through the lighting of a memorial candle, your thoughtful gesture will be recorded in the Book of Memories and the proceeds will go directly towards helping ensure that the family and friends of Harriet Therrien can continue to memorialize, re-visit, interact with each other and enhance this tribute for future generations. 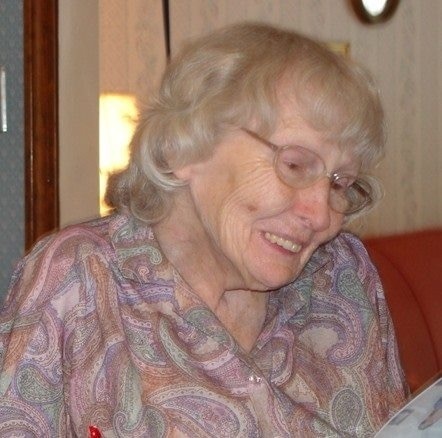 GRAFTON – Harriet M. Therrien, 97 died Sunday March 31, 2019 in Beaumont Nursing Home in Northbridge. She leaves three sons William and his wife Claudia of Mendon, David and his wife Nancy, Herbert (Terry) and a daughter, Kathleen Malmquist, all of Grafton. She leaves a brother Richard Cahill of Quincy, Ca. Fourteen Grandchildren; Christopher and Elizabeth Plante, Joel and Jon Therrien, Jenifer Langley, Michael and Laura Therrien, Rodney, Amy, Raymond, Matthew and Jaelyn Malmquist, and Farley Nishanian. Nineteen Great Grandchildren; Kevin Therrien, Jacob, Noah and Emma Plante, Cora and Grayson Fessenden, Freya and Averon Langley, Alex, Bryan and Cayla Therrien, Jordan, Isaac and Canaan Therrien, Danielle Therrien, Cori, Ryan and Jessica Malmquist, Hope Lloyd, and many nieces and nephews. She is pre-deceased by her Husband of 75 years Herbert L. Therrien, and a daughter, Diane Plante. She was born on January 1, 1922 (Daughter of John E. Cahill and Ida Koskela) in Framingham Massachusetts. She graduated from the Hopkinton School System in 1939. After school she married and raised her family in Grafton. She worked as a nurse’s aide for thirty plus years at a number of Nursing Homes, retiring in the early 1990’s. She enjoyed camping, crafts, painting, gardening, and spending time with her family.